After my first Yankee Challenge, Big Southern Breakfast, I picked up a few Southern cookbooks at the library, so I could read up on popular Southern dishes and how to make them. I felt very prepared when I was assigned my second Yankee Challenge: a Southern Vegetable Plate. 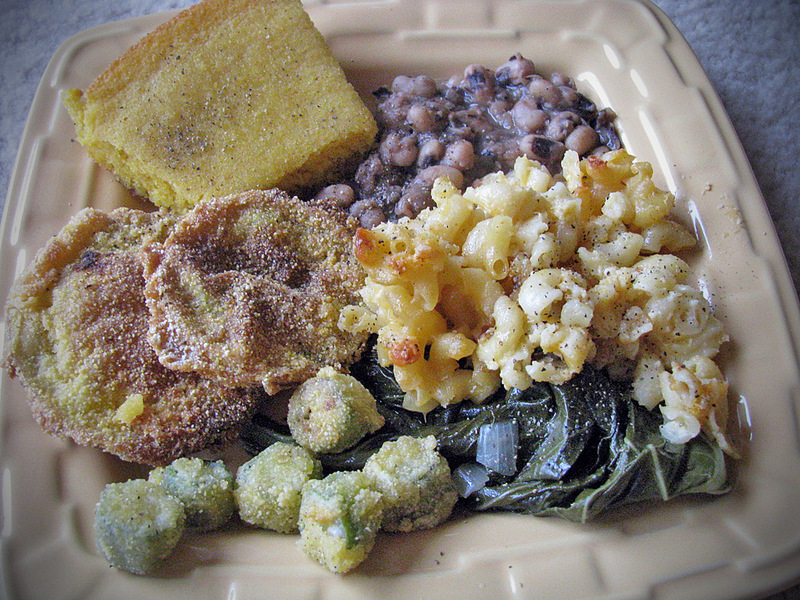 There would be five vegetables: fried okra, collard greens, fried green tomatoes, black eyed peas, and macaroni and cheese (yes this is a veggie), plus a side of cornbread. 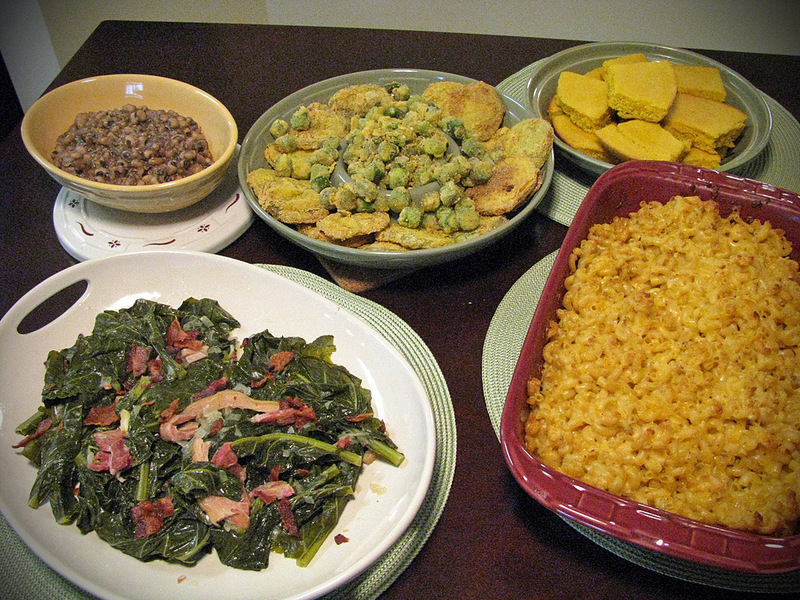 There were some rules like the last challenge, that involved making the cornbread and mac-n-cheese from scratch, frying everything in the cast iron skillet, using dried black eyed peas, and the collard greens needed to be cooked with a ham hock or salt pork. Um, what the heck is a ham hock?! Thankfully I found a ham hock at the grocery store, right next to the chicken livers (or something equally yucky). And it wasn’t as scary as I thought it would be. They sort of resemble small ham steaks, but dry and salty. For my Southern Vegetable Plate I would have a larger audience to feed, so I was really feeling the pressure to impress my friend, husband, and MOM. It took me almost four hours to prepare the entire meal and would have taken longer if my Mom wasn’t washing dishes and cleaning up after me. Do you know how messy frying food can be? I had to cook the cornbread first because it needed to be done in my cast iron skillet. Once again I must say, I am going to need to invest in another cast iron skillet to cook big Southern meals! The cornbread was made with buttermilk, eggs, and cornmeal, and maybe a lot of melted butter. It came out of the oven piping hot and my Mom nodded with approval as she put a steaming piece into her mouth. Next I rinsed and drained the black eyed peas. They look so funny when they are wet. Like little beady eyes staring back up at you. It was kind of creepy. I dumped them in a huge cast iron dutch oven, covered up with a ton of water, salt, and tossed in a few pieces of the ham hock! Those little eyes cooked the longest – almost 2 hours – and when they were done, wow…I’ve never had black eyed peas, so I didn’t know how creamy the pot of beans would become, while still maintaining the shape and consistency of beans. 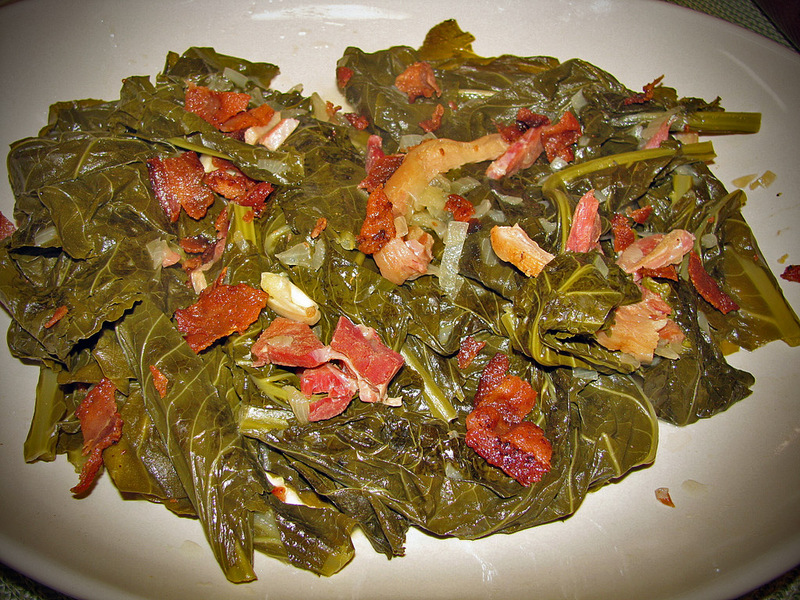 The collard greens were cooked in my big Yankee lobster pot, haha, along with apple cider vinegar, water, and more pieces of the ham hock. 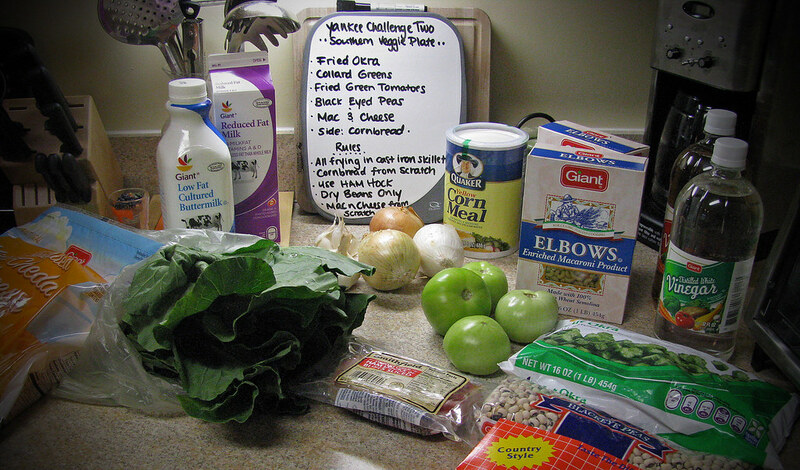 I left the giant leafy greens whole, but removed the leave’s thick stalks. The greens cooked for over an hour. When I tasted a big leaf, I was surprised to discover that even though all of the greens had wilted, they had retained their crunch. Mm.. mm.. good. So much better than soggy spinach! I was not worried about making the macaroni and cheese from scratch. After reading up on Southern cooking, I learned that while Northerners make their mac-n-cheese with a béchamel sauce, Southerners use eggs, milk, and shredded cheese. Seemed pretty easy. After cooking up a big pot of elbow macaroni, I whisked eggs and milk together in a large bowl. I stirred in a ton of shredded cheddar cheese and seasoned everything with salt, pepper, and Cajun seasoning. I added the macaroni to the bowl and mixed everything until it was combined. Then I transferred it to a baking dish and drizzled melted butter over the top so the noodles would not dry out while baking. My macaroni and cheese was creamy, cheesy, and almost perfect. Next time I will add a breadcrumb crust. And more butter on top. Yum! 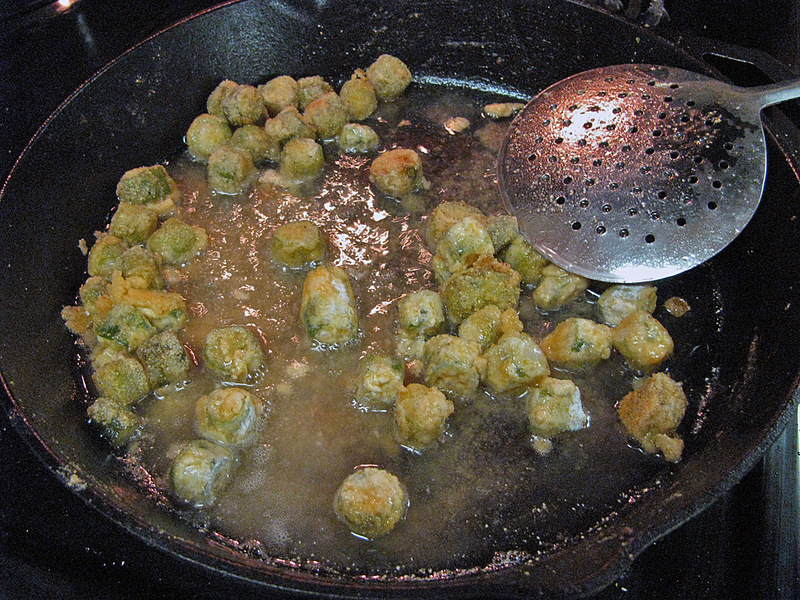 The fried okra and fried green tomatoes were not as tricky as I had imagined they were going to be. I coated the okra in buttermilk, dredged them in a mixture of cornmeal and flour, and fried them in canola oil in my cast iron skillet. 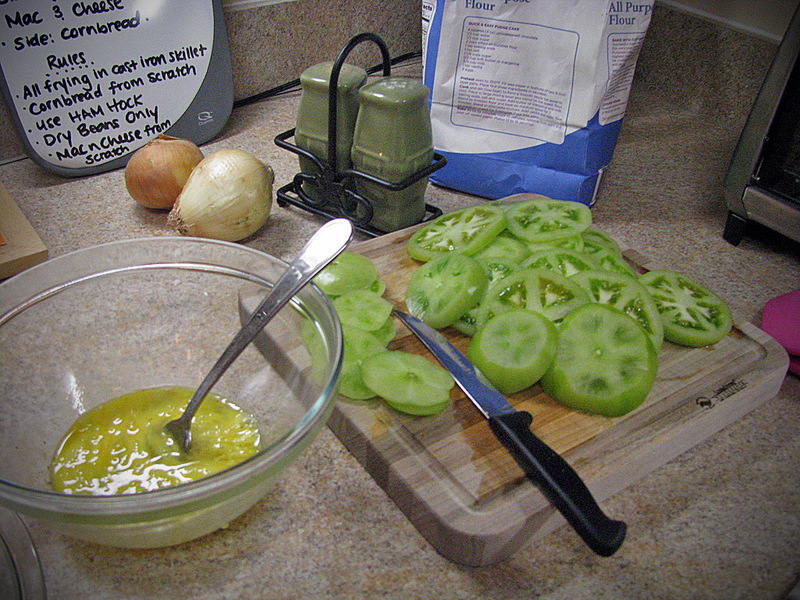 The green tomatoes were sliced thin, dipped in egg, also dredged in a cornmeal/flour mixture, and fried in canola oil. I fried the veggies in small batches, removed them from the skillet using a slotted spoon, laid the greasy crispy little guys on paper towels to dry. Finally I seasoned them liberally with salt and pepper. I didn’t really care for the okra, something about a slimy green vegetable just makes me squirm. The fried green tomatoes though… crispy on the outside, mouth-wateringly tender on the inside… if I didn’t get so sick from fried foods I would eat fried green tomatoes with every meal. Overall, my guests said that their “Southern Vegetable Plate” was DELICIOUS! I think that everyone went back for seconds and the only reason I had leftovers was because I had cooked for an army. Their only complaint: the cornbread was a bit dry. I definitely agree that after the cornbread sat on the counter for three hours waiting for the main dish to be complete, it had dried out – even after I melted butter on top of each piece. Looks like I will be calling MawMaw to ask for her recipe next time I make cornbread; her cornbread from scratch is always moist and scrumptious. Full Gallery of Images from this challenge here. All of the dishes were cooked by me – none of the dishes were made from a strict adherence to one recipe. After reading a ton of Southern recipes online and Bon Appetit, Y’all, I whipped up each dish on my own. I can confirm the meal was delicious as I am the MOM who was there. Now I am from the north and was raised on Italian food. I was skeptical that I would enjoy this. Caitlin did a great job putting it together. Probably the most amusing thing was when we went to the store to purchase wine for the dinner. Watching the clerks face as Cait explained what dishes were going to accompany the wine while she asked for suggestions. This was not an easy task said he. He asked her what types of red wines she liked and with his help we went home with a light Pinot Noir (Poppy) that worked really well. All I can say is the meal was great! I will never think I know how something tastes without trying it. Kudo’s to the chef! Looks mighty fine to this southerner! 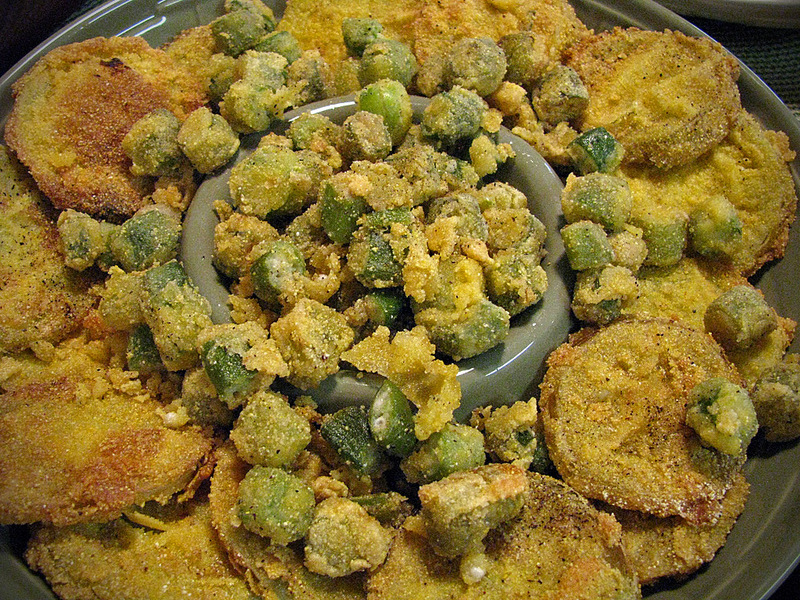 Mmmm, it all looks so delicious, especially the fried okra and mac-n-cheese!!! Wow, It sure makes me hungry! It all looks so pretty too! mmmm looks scrumptious, wish I was there! Looks like a job well done!